Handmade Harbour: Hello, New Fabric! It's always exciting when a parcel arrives in the post isn't it? This one got lost along the way and spent a day or two hanging out with the people who live next-door-but-one. Ironically, they were out when it arrived and it was left in a plantpot in their back garden (I was probably in at the time). Still, it got here in one piece . 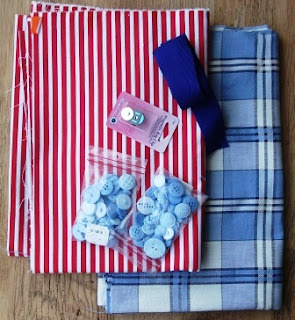 . .
and this is what I chose for my next £15 budget challenge from Abakhan: a metre each of contrasting fabric, buttons, webbing and a magnetic fastener. 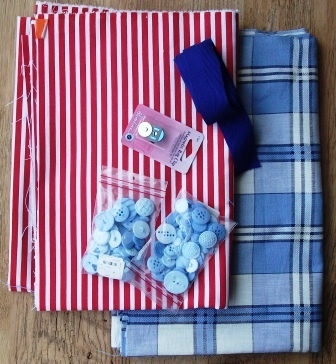 I'll be making a beach bag/shopping bag - with beach huts on the front (that's what inspired the red and white stripe!). OK, so there's way too many buttons for this project but they'll certainly not go unused for long! I'm adding a little bit of fabric from my stash, but probably not much. The real purpose of this bag will be as my post office bag. The post office run is a daily one here and most of my shopping bags are a bit too small to be useful so I'm usually to be seen carrying an outsize Tesco bag. I'd think I'd rather have one with beach huts on! Always exciting, like Christmas! Will be glad to say bye bye to the Tesco bag! I can see the beach huts now! Great to receive interesting parcels like this even though it did make a detour! Look forward to seeing the finished article.